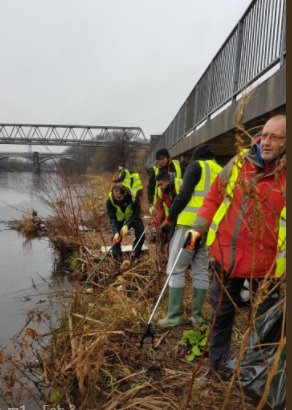 On Saturday 3rd February 2018, we gathered at our local River Calder for a community cleanup. Near Thornhill road, by the weir, was dirty and littered with bottles and pieces of plastic among other things. Our Kumon Y’all young volunteers teamed up with many faces, community residents and organisations such as: GoDewsbury, Friends of Rectory Park, Kirklees Adventurous Activity Team, Pennine Canoe and Rowing Club. A special thank you to Noddy who braved the cold and choppy water and set sail collecting rubbish on canoe! 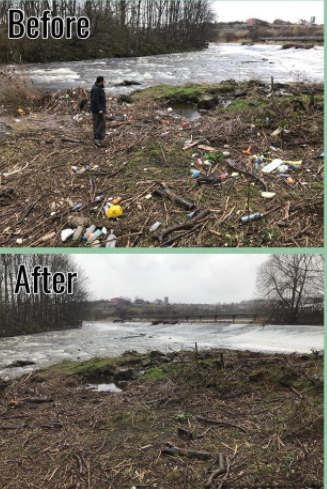 All our volunteers voyaged on land, cleaning the littered mud banks and river edges ensuring that we left the area washed up of any litter and cleaner than before. Overall, we had a most enjoyable morning with a total of 122 bags of litter was gathered up and more larger items were found too. This project is exemplary in showing that ‘more hands really do make the work lighter’and in a matter of a few hours the entire area around the weir was clear. This was a show of many residents and friends and volunteers coming our for a common cause, the cleaning of our Dewsbury waterways. Kumon Y’all would like to extend a huge thank you to ALL that were involved in this project. If you wish to organise others in other areas or feel you have found a need elsewhere, we will be more than happy to help. Click HERE to see the article from Natural Kirklees. And of course, some pictures of us in action!